Recently Beijing Tale, a non-governmental organization (NGO) reposted a picture in which a mother was breast-feeding her child on the Beijing subway and accused her of "exposing her sexual organs" in public place. The post also mockingly noted that the mother should be reminded that she was taking the Beijing subway, not a bus in her village. The post has sparked wide discussions and mostly criticism. Is breast-feeding appropriate in public spaces? Are people's reactions uglier than any supposed fault on the mother's part? The UN recognizes breast-feeding as a necessity for mothers, while the taboo against public breast-feeding has long been dropped in most developed countries. The Global Times collected three commentaries on the matter. It's nothing new that controversy is sparked by breast-feeding in public and similar cases have happened in places like the bus, square and shopping mall. Apart from the criticism by netizens about the NGO repost, whether breast-feeding in public areas should be allowed is worth discussing. Conflicts can arise when breast-feeding, a private act, takes place in a public place. Its complexity can be detected as in previous similar incidents, the public didn't overwhelmingly support mothers. People regard breast-feeding in public from different perspectives. Many mothers understand deeply the mixed feelings when their children cry for milk and there is nowhere private on the subway. But some still consider it inappropriate to expose parts of one's body in a public place. The divergences call for mutual understanding and tolerance. Mothers can prepare some ways to cover up the sensitive parts or breast-feed their children at a distance from the public. If they have to breast-feed children immediately, people around had better act civilly by turning around or offering ways to cover-up. Mocking or photographing is the worst thing to do. In fact, setting a separate room for breast-feeding in public places such as subway, shopping malls and offices could solve almost all the problems. In this case, China needs a lot of efforts to catch up in urban planning. There are no binding rules or regulations concerned and such specific rooms are barely found in even most developed cities like Beijing and Shanghai. In comparison, many countries such as Canada and the UK have done well in this respect. A friend of mine living in Japan always finds it inconvenient to breast-feed and change diapers in China. Apart from governments' planning and input, shopping malls and enterprises need to realize that setting such a room could be beneficial. The former can improve their shopping environment and even improve their brand reputation by advertising their presence while the latter can enhance the efficiency and loyalty of staff. As China is aging and the two-child policy has not achieved expected results, equipping breast-feeding room and improving baby-raising environment are important measures to encourage people to have children. Beyond this, it would be a symbol of civilization to provide human-orientated public services as this shows respect and care for women and children. The recent disputes over a woman breast-feeding her child before the public reveal other sides of the era with anxiety and insufficient civility. It's ridiculous to describe breast-feeding on subway as "exposing sexual organs" in public places. There is a primitive greatness in women who would do everything for their kids and this shouldn't be seen from such a vulgar perspective as the post suggests. Many countries and regions in the world, such as the US, the UK, Canada, Australia and the Philippines legally support and guarantee women's rights to breast-feed their children in public places. This displays care for mothers and children, support for breast-feeding and also the precious humanity. As some women complain, do they have much time to look for a suitable private space when their children scream? Or is it "civilized" to neglect babies' crying? Most mothers think that it is inappropriate to breast-feed their children in the public, but in the event of feeding kids, mostly proper conditions are absent. In 2013, a simple breast-feeding area was set on a bus in Zhengzhou, Henan Province, with curtains. This can provide some useful inspiration. Women are unlikely to still breast-feed children in public if there is such an area available. Blaming mothers for improper behaviors while it is actually caused by insufficient conditions is ridiculous. Even though spectators don't agree with the mother's behavior on subway, they need to mind their boundary. In this case, secretly photographing the scene and posting it online is an abusive act. It would be more acceptable if spectators give a kind reminder, have discussions on social media or create a relatively convenient space at the scene for the mother. The prejudice and arrogance shown in the comparison of a Beijing subway with rural bus should have long been ditched. The controversy necessitates discussions on three questions. 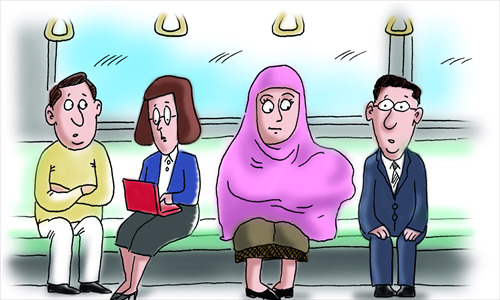 Can the subway provide a suitable space for women who need to breast-feed, as the bus in Zhengzhou did? How should the spectators view the scene? Should mothers learn some tips to cover up their breasts when feeding children in the public? The disputes triggered by the breast-feeding incident reflect the interactions and complexity between public space and individual behavior in modern society and also the public's attitudes toward protecting women's rights. The NGO's post has triggered hot debates. When a young mother breast-feeds her child, some people see motherhood while some only catch a glimpse of "sexual organs." If breast-feeding in the public is considered inappropriate, it would be more inappropriate when onlookers take a picture and post it on social media without pixelating the child and mother. The NGO actually reposted another Net user of Sina Weibo, but the reposting by a verified account showed the organization's callousness. After being condemned by a majority of netizens, the NGO apologized and promised to unsubscribe to the account. People feel offended by the post not only because of the improper wording, but the superiority reflected herein. Comparing the rural bus to Beijing's subway proves nothing but ignorance. As one writer said, superiority, like costly lingerie, can only be shown off at home and exposing them in public to belittle others would be degrading. Besides, people who breast-feed their children in public places are not all from the countryside. As some netizens said, a young mother wouldn't breast-feed her child before the public if she had other alternatives. After all, women would not like to have her privacy and body seen by others. In this case, anyone who has basic sympathy and care wouldn't make judge the mother so arrogantly. Of course, it would be narrow-minded to rest simply on criticizing the repost by the NGO. A hidden but crucial question is: Why did people firstly point their fingers at the mother breast-feeding her kid rather than the absence of a space specifically for the necessity? Breast-feeding in public is not quite decent and has long been controversial. But beside advising women to watch their appearance and protect themselves, it's more important to discuss how to allocate sufficient areas on public transportation for mothers in need. At least 38 US states have made laws to protect women's rights to breast-feed their kids in restaurants, shops and other public places. Even if people find it hard to respect the right to breast-feed, at least they cannot target mothers. More importantly, they have to ask where a mother can breast-feed her child when the kid cries for food.